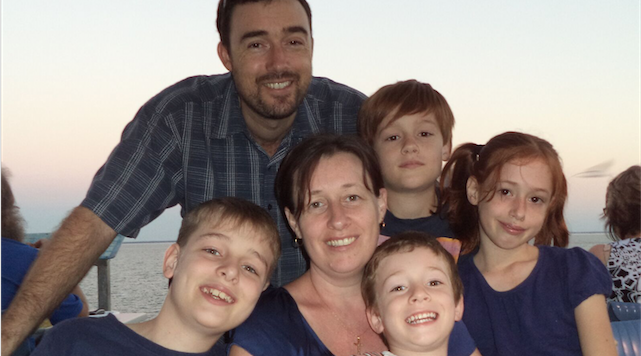 Aussie representatives: Cathy and Matt Bourke with their children Michael, Joel, Trinity and Sebastian. WE believe it takes a village to raise a child and so much of our village is the Church, Cathy and Matt Bourke told the Australian Catholic Bishops Conference recently. “Raising families is an extremely vulnerable time of life and possibly the hardest job to get right. It is the most important vocation in manifesting the domestic church,” they said. Matt and Cathy believe a vibrant Catholic family community is also vital in the faith journey to share values and life’s challenges with other families. The Darwin-based couple will represent the Church in Australia at the World Meeting of Families in Philadelphia, United States, from the September 22-25 where they look forward to seeing Pope Francis. The couple have four children: Michael (12), Joel (11), Trinity (9) and Sebastian (5) – all born in the Northern Territory. Nominated by Carwin Bishop Eugene Hurley, the Bourke family have overcome many challenges in life and learnt to appreciate their blessings including the arrival of their son with special needs. “Our son has taught us more about God’s love than anyone could imagine. He inspires us with his strength, patience and faith. He courageously overcomes obstacles and accepts limitations daily,” Cathy said. In 1997, the couple met in Melbourne while participating in the Jesuit, Mercy Sisters and Christian Brother sponsored Australian Companions Volunteer Community program and they married four years later. Describing their marriage as “a partnership between two best-friends”, the World Meeting of Family delegates said, “we’re there to support one another through the challenges of parenting, work and study”. This strong sense of faith was instilled by the example of the couple’s parents, Catholic schooling and the Antioch movement. Cathy described being influenced by images of a compassionate Church through media coverage of Blessed Mother Teresa. “Our prayer life at home includes Grace before meals and the Rosary as often as possible. We really encourage the kids to pray before school for all their fellow students, their teachers and their day ahead,” Cathy said. Matt is the oldest of four boys. He was born in Newcastle and spent many formative years in country NSW before returning to complete his education. Matt is the Assistant Principal Religious Education at O’Loughlin Catholic College in Darwin. He has recently completed a Masters in Theology: Religious Education with the Broken Bay Institute. Cathy is the youngest of seven brothers and sisters. Born in Warragul and raised on a dairy farm in country Victoria and later in Hervey Bay, Queensland. Cathy is studying social work. Church life is an essential part of family life for the Bourke family. Since arriving in Darwin almost ten years ago, the family has participated in St Martin de Porres Catholic Aboriginal Community in Darwin. The original purpose of this community was so Aboriginal people had a place to worship that could be uniquely their own and to develop their gifts and ministries in service of the Church. Cathy describes being “embraced as part of the community, which is unique in its make-up and function: powered by a strong presence of the Holy Spirit, reconciliation in action and Indigenous leadership”. “Our participation in the life of St Martin’s has increased our understanding of what community is and, through Indigenous appreciation of family, has increased in our children a greater sense of their own sacredness,” Cathy said. Matt said: “The demands on our time as parents with four children and all the related commitments produces challenges in finding quiet time for prayer, especially family prayer. Sometimes journeying as a Catholic family attending mass on Sundays can be discouraging given, at times, the scarcity of other families with young children”. The couple also provides support at diocesan level as a mentor couple preparing engaged couples for marriage by facilitating the parish Marriage Resource Centre’s “Smart Loving” program. ‘Over the years, we have facilitated and offered our home as a venue for other activities including Lenten and religious discussion groups,” Cathy said. In recent years, Matt led a music ministry team and a prayer group called Exalt: inviting people to pray through praise and worship. The couple were grateful for being chosen as delegates to represent the Australian Catholic Bishops Conference at the World Meeting of Families. “We feel incredibly privileged to be nominated, let alone selected, to represent the Catholic Church which we so love and feel blessed to be part of,” Cathy said. “We are looking forward to sharing the pilgrimage with other couples and their kids. The family will be preparing for the gathering through prayer, reading and discussion with others about what they see as being important to family life in the Church. “Love is our Mission: The Family fully Alive” is the theme of the WMF this year. “It is what we want and seek for our family and believe can only truly be found in knowing God and being in relationship with Him as a family and in relationship with others,” they said. By Aoife Connors – media and communications director of the Australian Catholic Bishops Conference.